Not only does deBebians design and manufacture bridal jewelry for women, we also make a plethora of men’s wedding band designs. We have plain rings as well as more elaborate designs, such as our men’s Celtic wedding rings. These rings feature iconic designs that are classic and can be worn and enjoyed for a lifetime. This two tone men’s wedding band is one of our most popular rings due to its distinctive appearance. This band is on the wider side and has a width of 9mm. 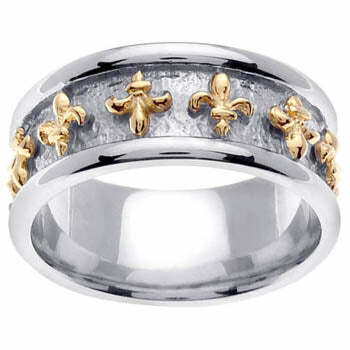 This ring is made in platinum 950 with 18 karat yellow gold fleur de lis embellishments. Choose your finger size to complete your order. Our customers can’t get enough of this braided gold band. The 7mm ring looks as if the gold is woven around the wearer’s finger. You may purchase this ring in your choice of 14 karat yellow gold or 14 karat white gold, whichever you prefer. Our men’s rings are available in whole, half, and quarter finger sizes. 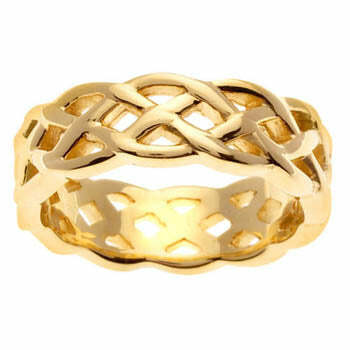 Celtic wedding bands can feature any number of symbols, including a triquetra, which features three interconnected loops. This symbolic represents the unity of three forces. This symbol may also be referred to as a trinity knot. This ring has a width of 8mm and is manufactured from platinum and 18 karat yellow gold. 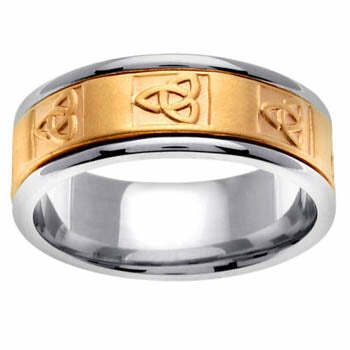 Please browse our entire collection of Celtic wedding bands for men to see additional styles.